Recorded at Bomba Studios in regional Victoria, Sleepin’ Rough picks up where 2015’s Sober & Godless left off. Booming from the get-go with ‘Patron Saint Of Thieves’, a thundering punk aesthetic intertwined through the group’s Irish and Scottish musical heritage, this album is full throttle, all spit and bile, raucous and real. Fans enjoyed a taste of the album from the melodic first single ‘A Fistful O’ Roses’, an emphatic protest at Sydney’s venue lock-out laws, with accompanying powerhouse music video directed by Josh Groom. But don’t make the mistake of thinking The Rumjacks are just an angry bunch of punks. Far from it – their music, while hard and fast for the most part, carries with it an element of fun and frivolity, harking back to their Old Country roots, places where music is an integral part of community gathering, soundtracking the times with an almost savage joy. 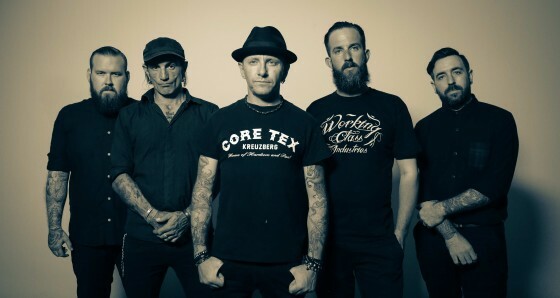 The Rumjacks are currently on tour through the UK and Europe, smashing out 94 live dates over five months with sold out shows from Birmingham to Berlin and everywhere in between! They are also playing a host of major European festivals, and will take to the main stage at Woodstock in Poland by popular demand, with a crowd of 150,000 destined to attend! The band will then return to Australia to lift the rockin’ covers off this remarkable record and, with a massive national tour planned for the latter part of the year, showcase these new songs live. Stories of life, love and loss, set to a throbbing beat, Sleepin’ Rough sees The Rumjacks in career best form. It’s what’s become vintage Rumjacks; it’s out the gate and straight down to business.